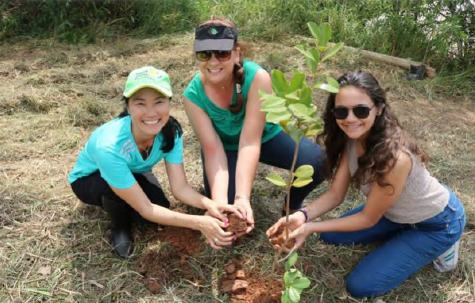 The Rotary Club of Suzano, Brazil, tackled a huge project to make a difference along the watershed of the Balainho Creek. They did an excellent job to involve the community and professionals in a variety of areas. They developed an exceptionally well-documented report on their activities. 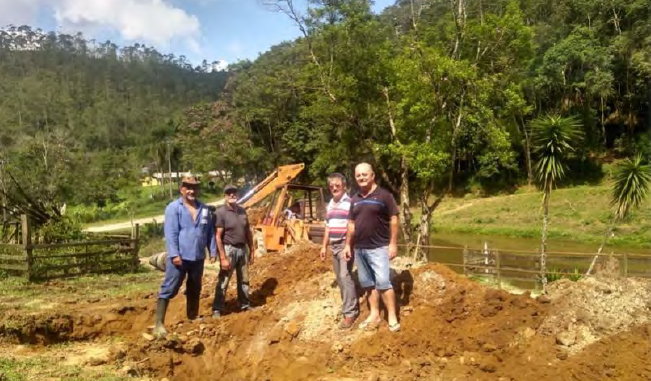 Rotary Club Suzano thought the project intending to cause a positive impact in the municipality of Suzano – São Paulo – Brazil, looking forward to step in environmental water issues. To bring in knowledge, and multidisciplinary technical quality Rotary Club Suzano invited professionals from several areas and representatives from local companies, building a task group with the great potential to execute effectively project’s actions. The actions’ scope was given by the water relevance, and also by the influence in the drinkable water supply to about 5 million people. All actions were taken around the Balainho creek watershed. The task group built interference actions on local environmental issues, which can become a pilot to public policies on the watershed. The group prioritized potentially continuous actions which could be implemented outside the project’s scope time, and not for the realization of punctual periodic and disconnected actions. Diagnosis, man-made environmental impacts, intervention actions. and acceleration of repairing actions, supporting the improvement of environmental quality. 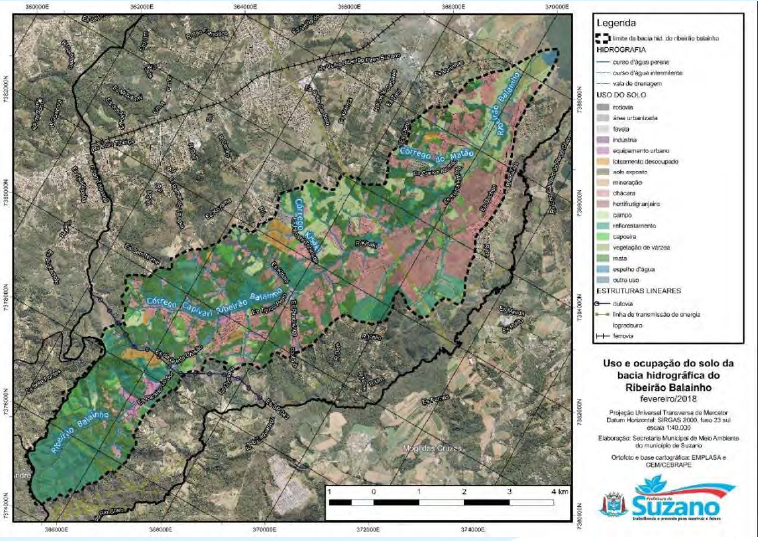 It is important to highlight that the choice of the sub-basin of Balainho for this project’s execution was given because it is a 100% rural zone, with a relevant amount of farmers and completely inside the borders of the municipality, within the Water Protection and Recovery Area (Área de Proteção e Recuperação dos Mananciais – APRM), which considers the sub-basin a regional interest for public supply, offering promptness and autonomy to Rotary Club Suzano, its supporters e the Municipal Office of Natural Environment, once there would not be need too coordinate mainstreamed with other municipal governments. Farmers and inhabitants of the watershed area. Based on the 2010 data analysis of Brazilian Institute of Geographics and Statistics (IBGE) census, it is estimated that the Balainho sub-basin harbors approximately 5.000 people. Roughly 5.000.000 people supported by the Sanitation Company of São Paulo State (Companhia de Saneamento Básico do Estado de São Paulo – SABESP) through its water treatment facilities Taiaçupeba. 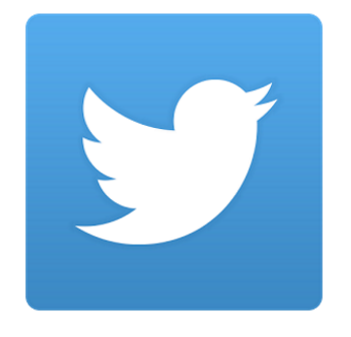 Planning meetings were made as the following monitoring of all parts of the project. At first, it was created a multidisciplinary team, composed by Rotarians, representatives of the local government, professionals, and entrepreneurs. Afterwards, it was elaborated the initial scope, coordinating necessary actions to achieve the needed ambient information, identification of stakeholders, and the formulation of mitigating measures. Diagnosis stage was split into two: theoretical research, aiming indexed information collection and field visits, which sought to check and describe the environment and the whole creek flow, and interview local people. The second stage sought the mapping of environmental impacts observed in the watershed area. The third stage focused on formulating intervention actions as a pilot model of interference. The fourth stage was distinguished by the implementation of planned actions. And the fifth stage intends to keep follow-up of fulfilled actions. The Balainho sub-basin is completely inside the borders of the Suzano municipality area, specifically south to Taiçupeba dam. Balainho is one of the rivers that flow into the dam, which is part of the Production System of Tiete River (Sistema Produtor do Alto Tietê - SPAT). The water treatment facility Taiaçupeba is also inside the municipality, the metropolitan area of São Paulo, part of the Production System of Tiete River, and is responsible for supplying water to the metropolitan area of São Pauloa, and some other cities around the Tietê river, offering drinking water to around 5 million people, which justifies the influence of the creek’s water quality to guarantee the supplying of the Production System. This means that part of the public supply of potable water depends on the Taiaçupeba dam and the subsequent water treatment in the treatment facilities: an operation that depends on the quality of water resources and the conditions of the sub-basin. Balainho creek extent is approximately 18.550m, and its hydrographic network has 59.790m, with an estimated number of 265 headwaters. The density of the drainage network is 1,71 km/km², indicating a propitious topography for the flow of superficial waters. Permanent Preservation Areas with headwaters and water flows sum more than 8km², or 23% of the watershed’s total area. 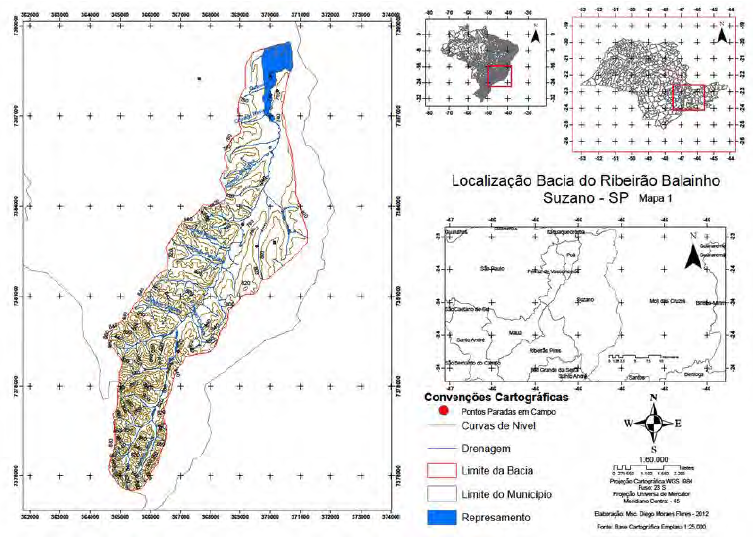 The longitudinal extent of the basin is 15.512 m, and its transversal average length is around 2.405 m. The municipality of Suzano has 60% of its territory within a Water Protection and Recovery Area, where soil usage and occupation is mostly rural, especially in the sub-basin, with an emphasis in cultivation (oleraceous, and ornamental). There is no effective exploration of livestock. Some areas are planted forests extensively handled. It represents de city growth towards the Taiaçupeba dam. The watershed has a larger influence in the rural lives. In this context, direct and impact mitigation actions coming from the project’s activities has significative relevance, given the general target of this purpose. Two expeditions were made intending to describe the basin on-site. The first expedition aimed to reach the central source of the creek, utilizando dados geo-referenced data. The second one sought to identify spots for water collection analysis in the whole basin’s extent, beginning by its rives mouth until the main water source, wild-life footprints were collected and flora and fauna species identified. Relevant aspects observed were listed and used as directions for planning intervention actions. waste directly in the watercourses. death of fishes and increase other forms of life such as algae. among it, which is used by locals to practice MotoCross activities. > Decrease of oxygen dissolved in water. lagoons, etc. Because of the lack of riparian forests. of the bottom of watercourses. increases the particle drag to the watercourses. to death or contaminating underground resources. setting fire to the ground in order to remove other plants. people, ignoring the action’s impact on the environment. Debris accumulates on the bottom of watercourses. and increase in the agriculture area. irradiation of heat to the atmosphere. Oriented by the commitment to the preservation of life as a whole, propositions were organized surrounding intervention actions, which sought to act on the ambient aspects that change the quality of the water in the basin. 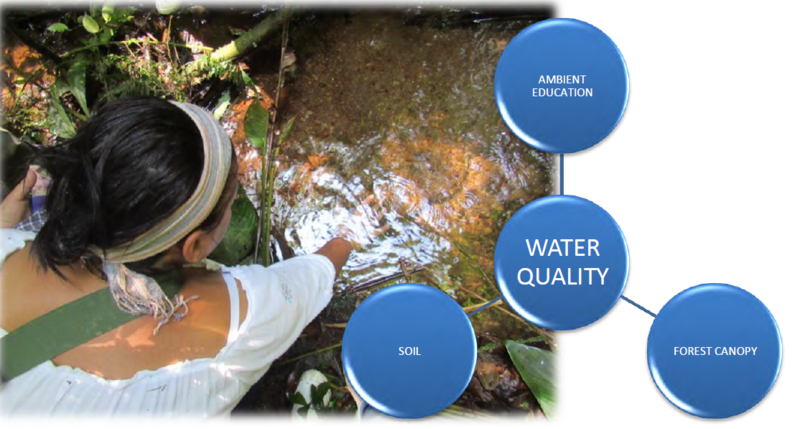 The project created three axes of action: central axe of quality of water, soil, forest canopy and ambient education. The absence of sensitization and mobilization campaigns related to the sub-basin. Biodigester septic tank increases sanitation in the rural area: the treatment of feces and urine left in rural residences. This is done by biodigestion, which is a process that uses fresh manure to eliminate bacteria and other microorganisms expelled by humans. The end of the process of biodigestion is the production of liquid manure, with no smell or threat to environment life or health. It can be used to fertilize and irrigate soil, making it better for the cultures. Also, it substitutes open sky sewer and old septic tanks. With no safe isolation, these old tanks allow detritus to infiltrate the soil and end up polluting underground waters, which is used in the homes of people in the surrounding rural area, giving them several diseases. Biodigestor septic tank will contribute importantly to the spread of the sustainable technology applied and will be useful as a pilot for other inhabitants of the surroundings, as a model, contributing, disseminating, and reinforcing the process of Ambient Education. 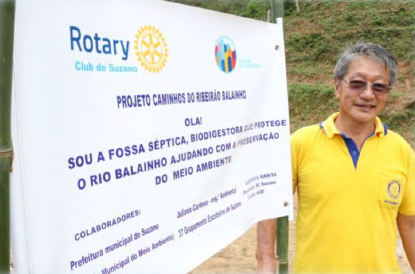 Rotary Club Suzano expects to amplify the number of biodigester septic tanks in rural properties in the watershed. The experiential ambient education is based on the stimulus of direct contact with nature, seeking reintegration of the human being to its natural habitat targeting a critic and transforming consciousness. This contact must be planed aiming to awaken the human enchantment for nature, provoking change in his or her behavior, known as on-site experience. It allowed the construction of cooperation laces and dialogue among participants, because of their actions, collective reflections, experiencing and noticing the amplitude and importance of the project. 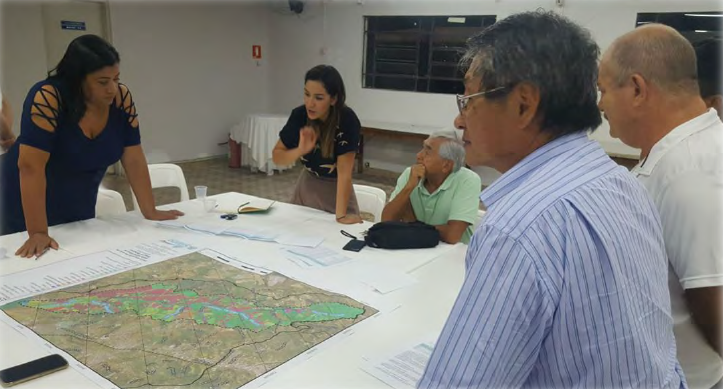 Knowing ecological interactions and their importance for the watershed is the first condition to acknowledge the connectedness of such ambient aspects, and that is why the expedition Ways to The Balainho Creek was made: a group of Rotarians, Interact, members, scouts e Suzano’s municipality representatives. Previously were identified spots for water collection, surrounded by diverse environment aspects, the expedition was born in the main water source and ended in the Taiaçupeba dam. The group was split into two teams coordinated by biologists and supported by a chemical engineer. 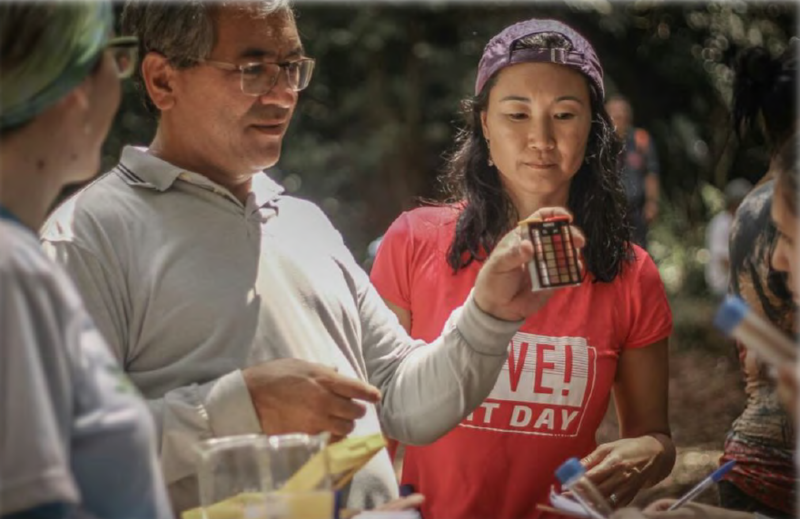 Each group received a bag with collection jars, thermometer and a form for notes on observations of the environmental aspects of each collect spot, such as time, spot, temperature, vegetations, insects presence, residues, flowers, color, climate, and others. Each guideline and its influence in the ecosystem was presented to the participants of the expedition, focusing on comparatives as the absence of riparian forest and its importance, and the modification of the guidelines when there are environmental impacts. Spot 1 was the main water source of the creek: its composition and hydrological resources were studied, using global positioned language and technology through an application. 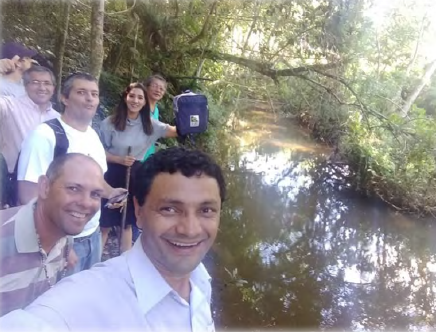 The group met areas using common septic tanks and the expedition finished in the Taiaçupeba dam, where participants lived the contribution to the creek and its supplying system. 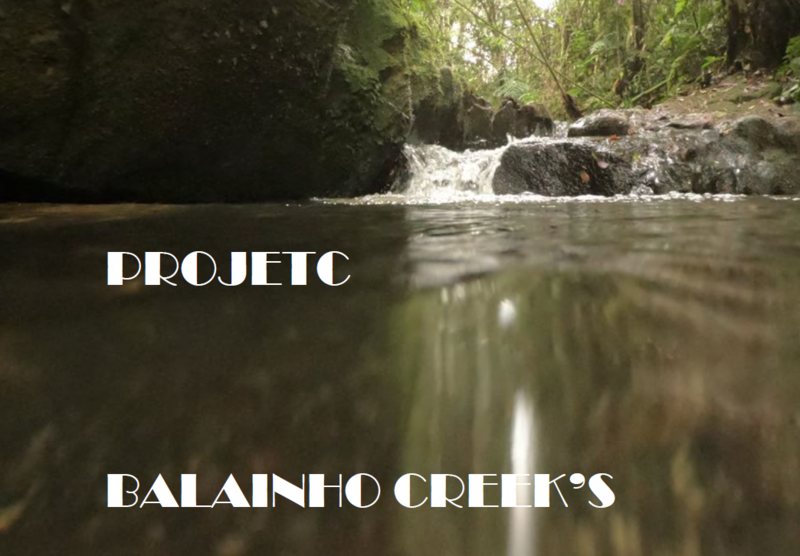 One of the great goals of using ambient education was to aggregate living mean to the project, and the construction of a community sentiment, and also the perception of the possibilities in actions of preservation in the Balainho creek. Residual forest fragments of the Atlantic forest influence without a doubt the quality of water in the rivers. Maintenance of the forest cover is paramount to the preservation of the water quality of a plethora. Countless processes occur inside a plethora and they can reflect the water quality, with a multitude of physical and chemical patterns which present the environmental mean of the direct influence of the integrity of the plethora. The presence of forest cover is paramount for the maintenance of water quality in rivers and water bodies in rural areas. Several native seedlings were planted near the central axe of the basin. 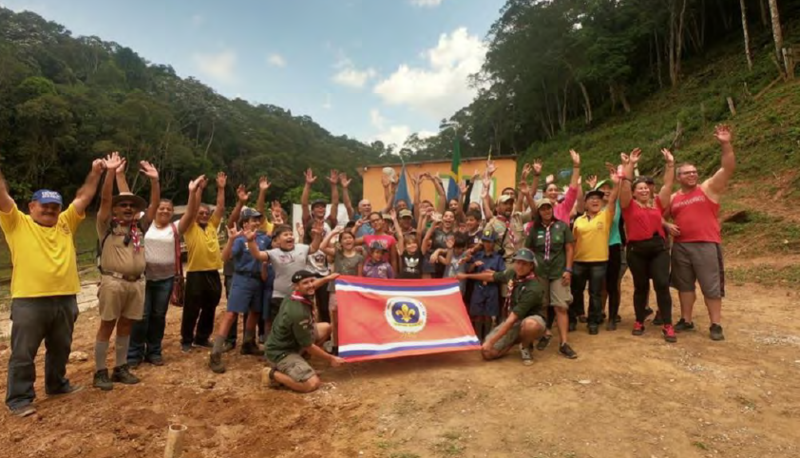 Planting counted with the partnership with Scouts Group 37 of Suzano and environmental influences were considered alongside with the importance of the environment. The project foresees a second phase with a workshop on “Recovery of the Riparian Forest in rural properties”. All actions will be amplified and disseminated among local inhabitants, seeking to augment the impact of the project. The Municipal Office for Environment will provide teachers in the city schools a course using the material and information collected in this project about he importance of plethora. Rotary Club Suzano seeks to amplify and disseminate the pilot experience produced a documentary video that will be presented to interested people, during the course or even inside classrooms alongside with teaching material. Rotary Suzano has partnered with one of Brazil's most respected nongovernmental organizations, the NGO SOS Mata Atlântica, which coordinates the “Observando os Rios” (Watching the Rivers) project, which aims to monitor Rivers located in the Atlantic Forest area, by monitoring waters through a analysis that permits the evaluation of the rivers from a total of 16 parameters, which include levels of oxygen, phosphorus, PH, odor, visual aspects, among others, and classifies water quality in five levels (IQA - based on the Conama 357 resolution) and has remote management tools and databases that allow it to be used by monitoring groups in several rivers and streams. It was selected two different points to a monthly analysis of water quality that will be reported to the NGO and will be published in the project’s website in real time. The partnership was celebrated in a Workshop about the Water, the Water Basin and Water Security so as the invitation to the students who lives nearby the Creek to be part of the project and contribute to its preservation and monitoring. The school is located alongside the river and most of the students are soon’s of agricultural producers of the region. 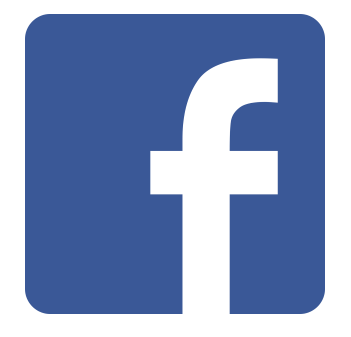 Sidney Savine – Bachelor in informartional systems. Dr Carlos Toshiharo Watanabe – Cirurgeoinformationalf Environment in Suzano City Hall. Juliana Cardoso – Environemntal Engineer, MBA FGV, MPA Columbia University - SIPA. Sidnei Marcos de Lima Franco – Chemestry Engineer , MBA FGV. Giovana Santana Savine – Jornalist. Felipe Nascimento Carvalho – Graphic Designer . Bianca Carla Nunes da Silva – Bachelor in Pedagogy and Biological Sciences. Grupo de escoteiros 37 Suzano.